Some people’s holiday wishes are about fancy new cars or expensive vacations or ipods or video games. Mine tend to be far simpler. They usually involve pork, and it’s usually cooked for a long time. It all started a couple of weeks ago when I opened a Hanukkah gift — a crock pot. It pretty quickly conjured up one image. Confit. Confit of something. Anything. Then I started thinking about pork belly. Pork Belly anything. And thus, the vision was complete. I turned to my seemingly most often referred to cookbook, Ruhlman’s Charcuterie, and sure enough, there’s a recipe for pork belly confit which is actually borrowed from Jim Drohman. The prep work started Wednesday afternoon when I placed an order at my local butcher, Let’s Meat on the Ave, here in Del Ray, for a crazy amount of locally raised pork belly. Half would go in the crock pot for confit, the other half in the freezer for bacon futures. 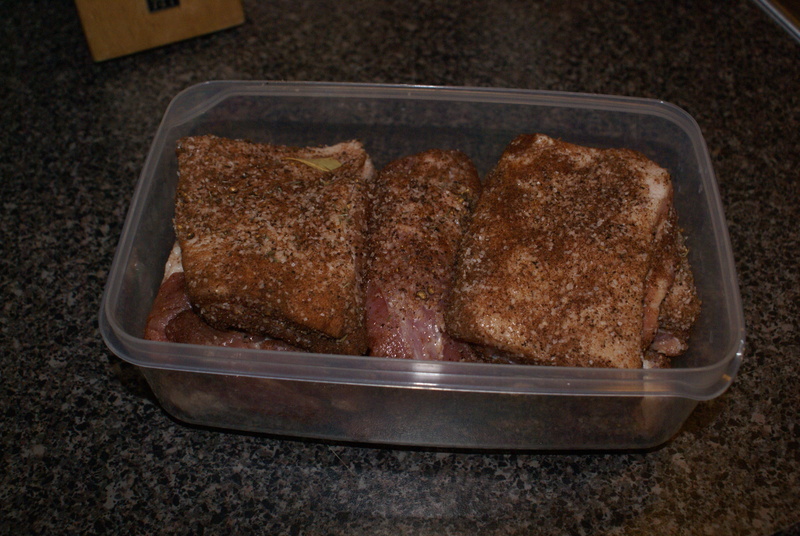 On Thursday afternoon, I picked up the belly, threw together the simple cure (which included such sweet and spicy ingredients as clove, cinnamon, and allspice,) and put the belly and cure in the refrigerator to cure for the next day. And Friday night is when I deviated from the original recipe. Drohman’s and Ruhlman’s version has you putting this in a 250° oven with rendered pork fat. Lacking sufficient lard and wanting to put my slow cooker to the test, I put my pork pieces in the slow cooker and topped it off with olive oil. 2 hours on the high setting, 2 hours on low setting. (Or, you could do 6-8 hours on low, if you wanted to leave it unattended.) Then I let this cool overnight. 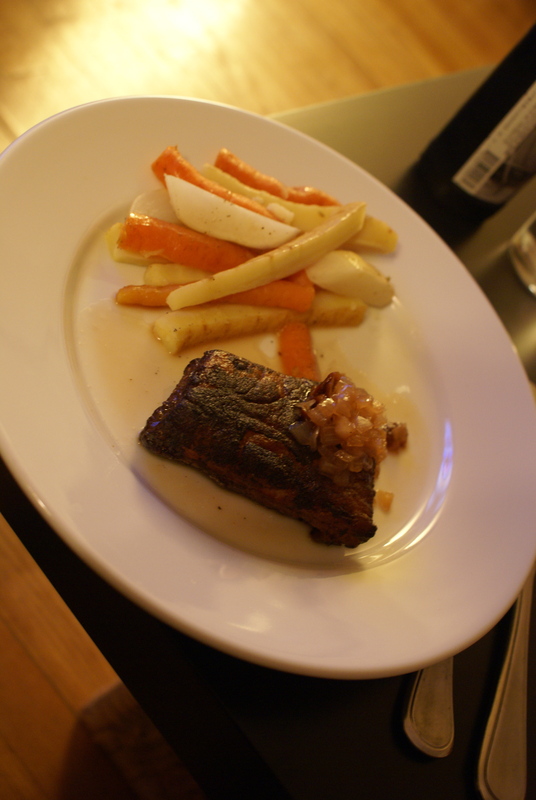 And, finally Saturday night, pulled out two portions and crisped them up in a saute pan. Mix the first 8 ingredients in a bowl. Toss the belly pieces in the bowl with the cure. Place all of the belly pieces in an airtight container, cover with white wine. Let sit for a day, day and a half. After the pork has cured, remove the pieces and wipe off any excess cure. 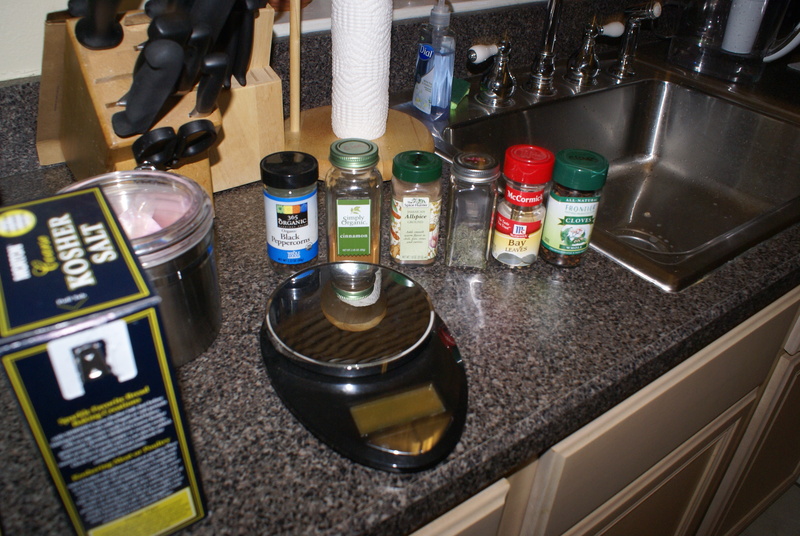 Place in your slow cooker and cover completely with oil or rendered fat. You can set your slow cooker to low and cook for 6-8 hours. Or run it on high for 2 hours, and then low for 2 more hours. After the all of the total cooking time, remove the pork and rendered fat or oil to cool. Place in an airtight container in the refrigerator overnight. When ready to serve, crisp each piece in a hot pan. You shouldn’t need to add an oil to the pan. The remaining pieces should keep in the oil in the refrigerator for several months. Damn, amigo. That sounds good enough for me to finally try and talk the missus into letting me use her crock pot for meat. Sounds amazing, I usually do prime-rib over the holidays but this looks like a truly unusual (and inexpensive) treat. I’ve never heard of curing with wine. Is there any reason I shouldn’t substitute the same champagne I’m going to buy for the cider reduction? I’d have to believe should work out just fine. Enjoy it. Making pork belly, crimini mushroom, apple, cornbread stuffing with sage, thyme – great stuff! Hi I will be trying this recipe starting tomorrow evening. For the slow cook portion, I am unclear. Would it be ok to just slow cook on low for 4 hours? Sorry about that. I’ve updated the post some to make this clearer. Either cook entirely on low for 6-8 hours or do 2 hours on high, then 2 hours on low. Place all of the belly pieces in an airtight container, cover with white wine. Let sit for a day, day and a half. Does it cure in refrigerator or room temperature? sorry did not read the above description Refrigerated. This is an amazing recipe doing it for this weekend thank you! !